There are 3 phases to creating your art glass: design, fabrication, and installation. Design includes everything from concept to glass/material choices to final design and quote. Fabrication begins with a 50% deposit to gather materials and then hand-make your art glass. Delivery and installation completes the project, followed by the invoice and balance due. Pricing is based on the complexity of the design and type of glass/materials used. Lead time is based on the quantity/size of the panels, fabrication complexity, and the projects already in our production queue. The design phase begins with a concept. You may know exactly what you want, have no idea what you want, or be somewhere in between. We can begin wherever you are, and walk you through the steps in a way that’s painless, interesting, and even fun! The first step is to see where the art glass will be installed (via photos or onsite) and discuss preferences, needs, and installation logistics. We do not typically charge for this initial consultation, see FAQ). We’ll consider the architectural style, décor, color vs no color, privacy/obscurity needs, and the “feeling” when viewed. We meet with all the decision-makers on the project including architect, builder, contractor, designer, window/door provider, and business/home owners. Our goal is to keep everyone on the same page and install perfectly the first time. What is the architecture and overall style of your home or building? Are you seeking privacy and/or is there an undesirable view you want to obscure? Do you want maximum light, subtle glow, or a different effect? Do you want the art glass to be the focal point or an accent? Do you prefer a more ornate look or something simple? Is there a theme or decor element you tend to prefer or would like highlighted? When viewing the art glass, would you like your reaction to be “Wow!” or “Aaahh…” or some other emotion? Is there some special meaning or inspiration you want incorporated in the design? (your initials, the memory of a loved one, a special event, a hobby or interest) Why not have your art also be a conversation piece? What are the installation logistics and how does that influence design? With this direction, we go to work creating your design. While we can use estimated dimensions for initial design and quote purposes, we will need exact measurements for fabrication. All our design work is hand-drawn with a unique software specially designed for art glass. We provide you, either in-person or via email, a to-scale version of your design, often with actual glass samples incorporated into the design. We may focus on a particular design or offer multiple designs from which to choose, and then revise as needed until we have created your ideal design. A full size version of the design can be printed to view its actual size. We can even tape this up in your home (or insert your design into your architectural drawings if your space is under construction) to give you a better idea of the scale and how the design will look when installed. Timing for Design depends on the amount of back-and-forth to confirm designs, but is typically 2-3 weeks. Once designs are confirmed, you’ll come to the studio to choose or confirm glass selection. Clients tell us this is one of the most exciting parts of the process as this is when the design truly begins to come to life. With the designs and materials confirmed, we can prepare a quote. Most projects fall into a predictable range of sq ft pricing, which is based on the complexity of the design and type of glass/materials used. Designs with straight lines and geometrics tend to fall at the lower end of the price range, while abstracts and nature scenes are higher. We can design based on your specifications and/or your budget. The type of glass also influences pricing based on whether we use clear textures, colored glass, opaque glass, antique glass, bevels, rondels, faceted jewels, or custom-made glass. Based on the design and installation specifications, we’ll work with you to determine the ideal fabrication method for your art glass. It could be lead came, copper foil, fused glass-on-glass mosaic, some combination, or something else entirely. We’ll also determine if reinforcing or insulation is required. Finally we account for delivery and installation as applicable. With the design, materials, and quote confirmed, we provide you a quote, which stands for 60 days (as materials may change in price and availability). A 50% deposit completes the design stage and launches the project into fabrication. Creativity doesn’t end with design; it’s present throughout the entire process of building your art glass and bringing it to life.All of our art glass is hand-made in our studio by our highly skilled artisans. Each piece of glass is hand-cut, the metal is hand-cut, all soldering is done by hand, and all patina and glazing is applied by hand. This is the same way art glass has been made for centuries; however, electricity and technology make our jobs much easier today! The fabrication process begins with full size printouts of your design. This assures us accuracy to 1/16″ inch of your panel size (which impresses our contractor clients) as well as assuring that every line and curve of your design is replicated exactly as intended. Then we cut the glass. 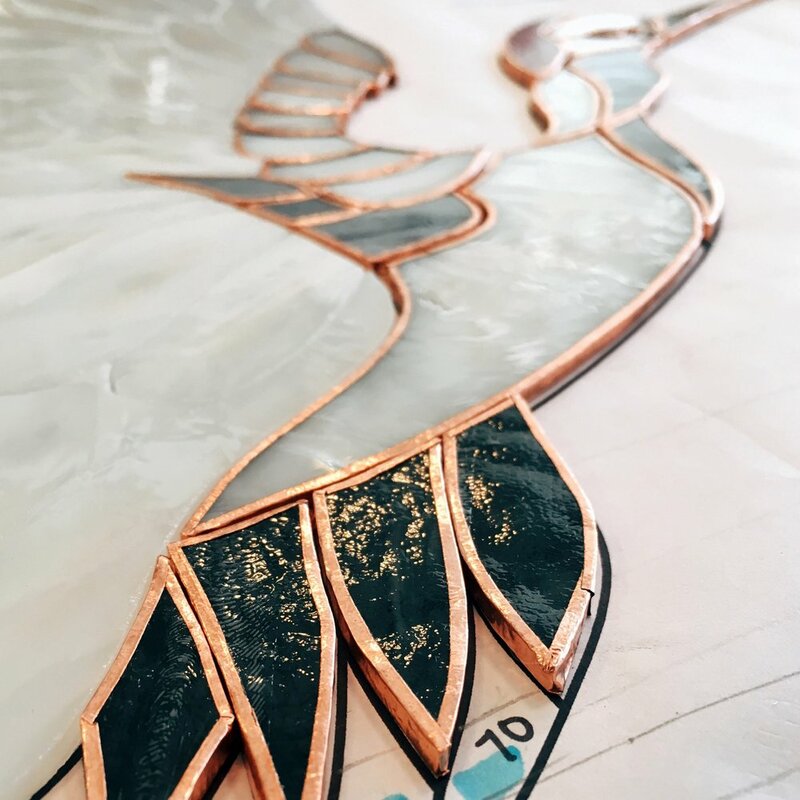 Each piece of glass is carefully chosen for the specific location, color, grain, opacity and look we want, and then cut and ground to the perfect shape and size. The glass pieces are all laid out on the design to preview what it will look like when completed. The next step is applying the patina and/or glazing putty to the art glass. We prefer the traditional dark charcoal color of patina. It's the most authentic approach and we think it best highlights the art glass, but other options are available. Once the putty cures, the art glass is hand-buffed and polished for delivery. Art glass can be triple-insulated for protection from accident and the weather, increased energy efficiency and security, noise reduction, and easier cleaning. Alternatively, single-pane applications also have their perks in that you can feel the leaded glass and it provides a more traditional, purist look. Both new and existing art glass can be insulated, whether it was created by us or not. The leaded glass panel itself is 1/4” thick. The clear insulating glass is minimum 1/8” thick and typically tempered or laminated. The finished insulated units are typically 3/4” thick, but can be minimum 5/8″ thick to 1″ thick (or thicker) depending on the installation specifications. We do not recommend dual insulation of art glass, which is joining the art glass panel to a single piece of clear glass. The art glass panel is weatherproof (but not strictly air tight nor watertight) so it’s impossible to create an air-tight insulated unit, which greatly increases the risk of condensation forming between the layers. Art glass is an investment and proper installation assures it will be enjoyed for decades to come. Unless you have a contractor/handyman in mind, we prefer to install your art glass ourselves so we can be 100% responsible that all goes well. We will deliver to the job site, remove any existing pieces of glass (and discard it unless you want to keep it), and install the new leaded glass panels. For exterior windows, especially if the panels are insulated, we strongly recommend installing the art glass ourselves using our highly skilled glaziers. It takes a particular level of skill and expertise with art glass to install insulated panels in a way that prevents any future issue. We offer our 5-year warranty on insulated panels only if our glaziers do the installation. Our clients, especially building professionals, count on us to deliver their custom art glass on time. A 50% deposit secures your place in our production queue, and once all materials are delivered, your lead time typically ranges from 3 weeks to 5 weeks, but is subject to change based on our current production queue and scope of your project. (Special order materials require extra time up front to receive. Insulated art glass requires extra time for the glazing to cure and is dependent on the weather.) With the Design Phase typically 2-3 weeks, and Production Phase 3-5 weeks, total project lead time typically ranges from 5 - 8 weeks, not including time for materials receipt. Our job isn’t complete once your art glass is installed. We can guide you on care and cleaning (it’s very easy) and any other questions or concerns you have about your art glass going forward. Warning: Art glass is addictive! Don’t be surprised if you find yourself walking around your house and begin to crave more art glass!